Why am I sooooo excited about teaching in California in February? Because winter is HERE, I am FREEZING, and I get to teach in California in February!! 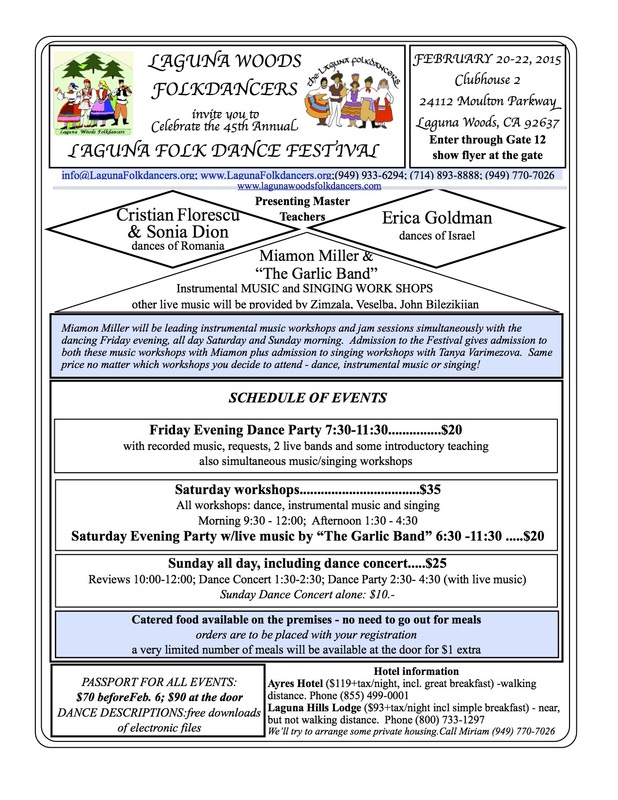 Hooray: I will be teaching Israeli dances at the Laguna Folk Dance Festival, which runs from Friday evening through Sunday afternoon, features dance workshops with, in addition to me, Sonia Dion and Cristian Florescu, dance parties with both live and recorded music, performances, and lots of great food! February 20-22, 2015 in Laguna Woods ! Register here. FEBRUARY 21 IS MY BIRTHDAY!!! So come dance and celebrate with me (while I try to absorb as much California sun as I possibly can in three days before returning to the frigid Northeast). and although I’m a full-time student and totally overwhelmed with schoolwork… HOW COULD I NOT TEACH ISRAELI DANCE?? My first class just started tonight – come join us or spread the word!! Tuesday nights at the JCC at 333 Nahanton Street in Newton. You can call 617-558-6500 for more details (or call or email me) or just come next week! Class is in a lovely dance studio with a good sound system and a great floor. The other students are warm and friendly and happy to be dancing! Other appearances to be announced soon (some in SoCal! ), so watch this space. And come dance with me! My dear dancing friends, I wish you all the best in 5775 – health, happiness, contentment, joy, laughter, perspective, adventure, love… and lots of dancing! Very warm wishes for a sweet year to you and yours. Gut yontif! L.A. Monday night dancers – I miss you so much and hope you are all doing well. Drop me a note and let me know how your year has begun! My dear dancing friends, I hope you will join us this Monday night for my last regular Monday night Mostly Couples session… after six years! And definitely don’t miss my real last night (and going-away party?) on Sunday August 3rd (no dancing Monday 8/4 due to Tisha B’av). I’m going to miss you!! Any requests for my last teach or two?? Marco’s coming, Marco’s coming! July 15th – don’t miss it! Happy Summer, y’all! Harel and I each move(d) up to camp this week, so summer is really here! Just before Rikud, we (re)-learned Dudu Barzilay’s 2001 dance “Don Kichote” and last week we also learned his new dance, “Bein Haptziot” – we reviewed that one tonight! The week right after camp we did Gadi Bitton’s “Achshav Karov”, a slow and pretty one to the Idan Raichel song, and tonight we learned Nona Malki’s new dance Romeio – here is a video of her dancing it with her husband Avi from Rikud. Enjoy! I am obsessed with the loveliness of both this song and this dance. I hope you love it too! See you tonight – we’ll review this and learn Dudu’s Don Kichote in advance of his coming to town at the end of the month!